Counted Cross Stitch Kit with Chart, Embroidery Fabric: 100% linen, Yarn: 100% cotton DMC, 12 threads (6 stitches)/cm - 30 count, Yarn organizer, Instruction in eight languages, Large-square charted design, Needle, Frontsheet picture, ca. 34 x 44 cm / 13.6" x 17.6", Age category: from 15 years, Stitches: cross stitch..
Drifting through the rose garden on a sunny afternoon, the lady of the mansion picks the perfect roses. Stitched on 18 count ivory Aida in beautiful shades of cotton thread, this Victorian masterpiece captures each petal in meticulous detail. Kit contains cotton embroidery thread, 18 count ivory Aida fabric, thread palette, needle and easy instructions including an easy-to-read multicolor c.. Counted Cross Stitch Kit with Chart, Embroidery Fabric: 100% cotton, Yarn: 100% cotton DMC, 5,4 stitches/cm - 14 count, Yarn organizer, Instruction in four/ eight languages, Large-square charted design, Needle, Frontsheet picture, ca. 32 x 48 cm / 12.8" x 19.2", Age category: from 15 years, Stitches: cross stitch, long stitch.. Counted Cross Stitch Kit with Chart, Embroidery Fabric: 100% cotton, Yarn: 100% cotton DMC, 10,5 threads (5,2 stitches)/cm - 27 count, Yarn organizer, Instruction in eight languages, Large-square charted design, Needle, Frontsheet picture, ca. 34 x 44 cm / 13.6" x 17.6", Age category: from 15 years, Stitches: cross stitch.. Counted Cross Stitch Kit with Chart, Embroidery Fabric: 100% cotton, Yarn: 100% cotton DMC, 10,5 threads (5,2 stitches)/cm - 27 count, Yarn organizer, Instruction in eight languages, Large-square charted design, Needle, Frontsheet picture, ca. 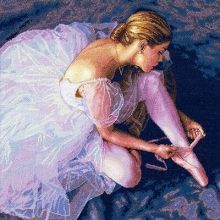 28 x 38 cm / 11.2" x 15.2", Age category: from 15 years, Stitches: cross stitch, long stitch..
A ballerina is the symbol of grace and beauty which can be seen in this exquisite counted cross stitch design. Tying her slippers in quiet concentration before she takes the stage, this beautiful ballerina is the timeless personification of the ballet. Stitch this exquisite dancer in muted cotton thread tones on 18 count white Aida, then add shimmering accents with gold metallic thread and blendin..
A young dancer will love having Ballerina Dreams on display in her room. Beautiful shading and detail make this counted cross stitch design a true masterpiece. Finished Size: 11" x 14" (27 x 35 cm). Contains presorted cotton thread, 18 count ivory cotton Aida, needle and easy instructions. Designed by Sandra Kuck..
A trio of toddlers prepares for a fun day at the beach in this counted cross stitch design. These little bathing beauties are ready to get a little sand in their suits! Kit contains cotton thread, 14 count ivory Aida, thread sorter, needle, and easy instructions. Designer: Donald Zolan.. Counted Cross Stitch Kit with Chart, Embroidery Fabric: 100% linen, Yarn: 100% cotton DMC, 12 threads (6 stitches)/cm - 30 count, Yarn organizer, Instruction in eight languages, Large-square charted design, Needle, Frontsheet picture, ca. 30 x 46 cm / 12" x 18.4", Age category: from 15 years, Stitches: french knot, cross stitch, long stitch, back stitch.. Boy King Counted Cross Stitch Design, License Rights Obtained Through True Colors International. Each kit contains: 14- count cotton Aida fabric, 6-strand cotton floss, blending filament, needle, graph, instructions. Size: 10 x 14 (25.4 x 35.6 cm)..
CHERISH HIS INQUISITIVENESS! Fall in love with this adoring, lad as he discovers the wonders from the sea. ©Nancy Cole's Counted Cross Stitch design will become an endearing reminder of a special time and a special child. Each kit contains: 14-count Natural color cotton Aida fabric, 6-strand cotton floss, needle, graph and instructions in English, French, Spanish and German. Stitch count: 169W x 2..